The first day of the tour included an in-depth look at Roth Farms. Rick Roth, owner of Roth Farms and District 85 Florida House Representative, showed the AgNet team around production systems and some other areas of the EAA. 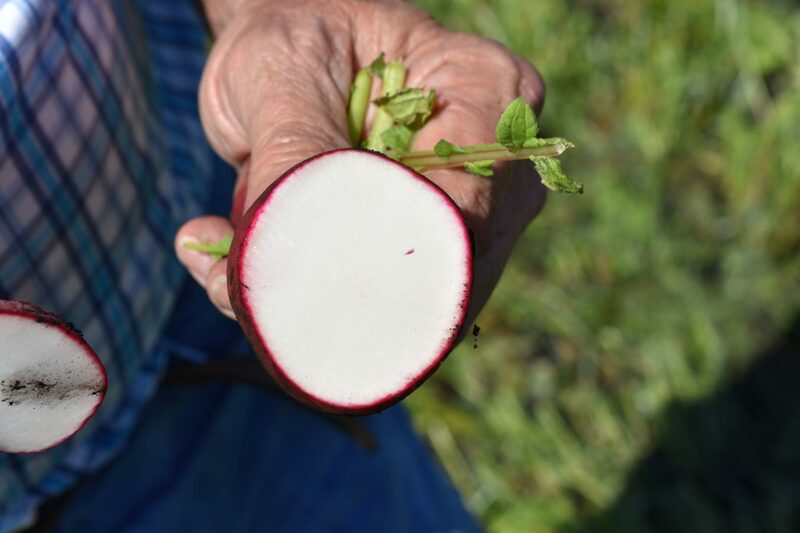 Roth Farms produces sugar, sweet corn, radishes and lettuce. Roth explained what makes the soil so special. Muck is an extremely fertile soil that possesses nutritional value using only sub-surface irrigation unless in cases of dry spell. These muck soils were lake-bottom historically, before the influx of people into south Florida required the taming of Lake Okeechobee with a dike to prevent flooding of what is now millions of homes to the south. The muck soil is rich with nutrients naturally and it doesn’t require over head irrigation in most cases, making it some of the richest farmland on earth. The tour began at the sweet corn plot, where Roth explained how his sweet corn is produced, from planting to harvest. He then took us to the radish plot, while the crop was being harvested. The harvester pulls the radishes from the soil, cuts the green leaves from the top and throws the product into a separate tractor bin, which is moving alongside the harvester. Roth also gave the team a look into what it takes to harvest romaine lettuce. A very labor-intensive crop, the romaine is picked, cut to perfection and put into bins. Within the slideshow above is a picture of some of the farmworkers harvesting the romaine. Roth ended the tour by driving the team around the surrounding areas of the EAA, where sugar, rice and spring mix are being grown. The spring mix fields, beautiful in their layout of different colors, grow in rows with the backdrop of the “black gold” soil. The different salad elements seen in the photos above will be washed, packed and delivered as fresh, ready-to-eat salad ingredients. Throughout the tour, Roth reflected on his own life as an EAA farmer. He fondly remembered giving tours to elementary school children and showing them what agriculture actually is. He believes an uneducated public is one of the most dangerous factors that may contribute to the decline of agriculture in Florida. He also spoke on the ever-growing urban areas, which are developing on the outskirts of the EAA. As urbanites close in on this unique farmland, Roth and his crew continue to chug away, putting dinner on the plates of Americans. The second day of the tour was all about sugar production. First up was a tour of U.S. Sugar Corporation in Clewiston. Judy Sanchez, senior director of corporate communications, and Ryan Duffy, director of corporate communications, led the tour through the U.S. Sugar production fields. U.S. Sugar hosts thousands of people on guided tours of their farming operations each year. These tours are a vital component of U.S. Sugar’s ongoing outreach and public education efforts to help combat continued misunderstandings and misinformation in the media. We were accompanied by a private pilot organization for the first half of the tour. The organization was visiting the area and made the trip to U.S. Sugar to learn more about the region’s sugar production. On the tour, the team witnessed a field burn. As the first step in the harvesting process, the sugar is burnt to eliminate the underbrush in the field before harvest. Witnessing a field burn firsthand, with high flames just a few feet away, the AgNet team and the group of pilots marveled at the spectacle of the controlled burn. It was performed in one 40-acre block at a time to control the flow of flames and the progress of the harvest operations that followed the burn. Within 24 hours, the sugar from the burnt stalks would become part of “sugar mountain,” a huge heap of raw sugar, but that marvel was yet to come. After the burn, the team saw the product being harvested. The harvester collects the burnt product from the ground, chops it up and throws it into a train car, where it starts its journey via train to the U.S. Sugar mill and refinery. Before traveling to the refinery, the team had a rare opportunity to sit down for lunch with U.S. Sugar Senior Vice President Malcom “Bubba” Wade, Jr. He presented an updated slide show with photos, data and other historical information from the South Florida Water Management District and other sources. The thorough presentation walked us through the history of water management, flood control and water quality issues in the EAA. After a hurricane in the late 1920s killed thousands on the south shores of Lake Okeechobee, control of the lake’s water was imminent. This led to the federal government constructing a dike to protect foreseen urban expansions in Florida south of the lake. The “black gold” soil that was then exposed in the EAA was found to be some of the naturally richest farmland in the world, as Roth explained a day prior. Photos in Wade’s slide show showed the tremendous urban sprawl of Florida’s Gold Coast expanding far into what used to be natural Everglades. This boom in urban expansion caused the natural flow of water to be forever interrupted in efforts to protect the millions of residents who now live, work and play on South Florida lands that are largely protected by the pumping and canal systems, which also allow agriculture to prosper in the region at the same time. We had the opportunity to discuss the ongoing water issues faced by U.S. Sugar and the local community, as Wade provided the team with research and personal observations. Research presented from the South Florida Water Management District showed the input and output of water throughout the district and the flow of particulate matter, like phosphorus, coming in and out of Lake Okeechobee and into the Everglades. The goals set years ago for farmers in the region to meet, in terms of phosphorous reductions and other water measures, have not only been met, but exceeded time and again. Although depending on other media reports, these favorable facts about agriculture in the Everglades may be harder to find. The visit with Wade was uniquely informative, factual and appreciated. Our visit concluded with Duffy giving us a driving tour around the mill, where we had the chance to see the famous “sugar mountain.” The huge heap is made up of raw sugar, which is going into storage from this year’s harvest. Nothing goes to waste in a sugar mill. In fact, the sugarcane bagasse, a byproduct of sugarcane production, is used to power the mill itself. Research is finding other uses for bagasse material as well. After departing from U.S. Sugar, the team visited with the Sugarcane Growers Cooperative of Florida, which has its offices at its sugar mill in Belle Glade just a few miles away. Barbara Miedema explained the history of the cooperative, then showed us around its mill. Miedema also explained ASR Group, which is a partnership between the Sugarcane Growers Cooperative of Florida and Florida Crystals. ASR Group is among the largest sugarcane refineries in the world, with refineries throughout the United States, Canada, Belize and Europe. The final day of the tour explored South Florida’s citrus industry with a look at Southern Gardens Citrus. The day began with a tour of Devil’s Garden Grove, led by grove manager Luke Davis. The team explored plots of different density plantings of Hamlins and Valencias, as the company continues to try different ideas in its ongoing research about growing citrus in the face of HLB. We saw blocks of Valencias that were 25 years old and still thriving, despite issues with HLB. Davis explained the steps his crew has taken in avoiding citrus canker by planting eucalyptus windbreaks around the perimeter of the grove, as well as having workers and visitors go through a sanitation process before entering the grove. Davis also discussed the grove’s damage following Hurricane Irma, where several feet of rainwater flowed after the storm in some blocks we were touring. The eucalyptus trees were tilted due to the high-speed winds from the hurricane. Little black balls on the ground surrounding trees in the grove were the remains of rotted fruit that had been ripped off the trees in the hurricane. This damage evidence made it much easier to see and understand the extent of fruit loss in this particular area that took a severe hit by the storm. Following the grove tour, we visited Southern Gardens’ modern juice processing plant. The facility undergoes annual upgrades and continues to install the latest technologies in the industry. A division of U.S. Sugar, Southern Gardens Citrus continues to be a leader in the battle to find answers to HLB and looks forward to being a key part in driving the revival of Florida’s citrus industry. This part of our tour was led by Jim Snively, vice president of grove operations. Like so many operations in agriculture today, there were restrictions on photographs in the processing plant. However, having the opportunity to see and feel what happens in a facility like this was a treat and the perfect way to end a great week on the road. Every part of the orange is used, from start to finish, including what is left after juicing. After removing all the byproduct, what is left is processed into cattle feed, which is made up of mostly orange peel with a few twigs or other materials mixed in. Snively noted the importance of the last step of the plant process, in that if something happened at the last step to halt the waste coming out of the citrus plant, the entire operation behind it would have to be stopped until things were working and back on line. An important takeaway from AgNet’s trip to the EAA is the importance of sugarcane production in this region. As Roth explained, without sugarcane, vegetables and other products would not be able to thrive in this area. Sugarcane is rotated with vegetables like sweet corn, radishes, rice and lettuce throughout the year. The crop rotation helps recycle soil amendments in the muck naturally, and allows the farmer to use less crop protection chemicals. 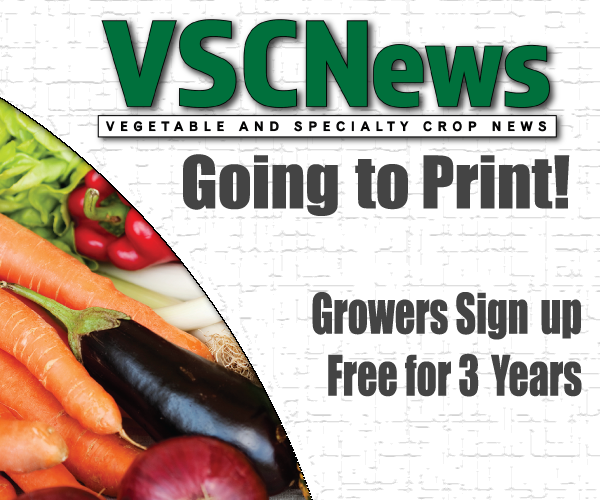 This crop rotation also makes EAA farmers farm year-round. Once the growers are finished with the vegetable crop, the soil will be ready for another sugarcane crop, which will last for years to come. AgNet Media would like to thank the various hosts that accompanied the team on its trip throughout the EAA: Rick Roth, Bubba Wade, Judy Sanchez, Ryan Duffy, Barbara Miedema, Luke Davis and Jim Snively. We look forward to visiting the EAA again in the future as we travel around the Southeast to explore the diverse agricultural operations this region has to offer.